A well-balanced, nourishing diet helps us all to thrive, fueling the important academic and professional work that happens in our classrooms, workplaces and research labs. Ensuring our communities have access to diverse, nutritious, safe and culturally acceptable food on our campuses is crucial to supporting their success, health and wellbeing. The UBC community has long supported sustainable and equitable food systems—UBC's Vancouver campus was the first Fair Trade campus in North America, the 24-hectare UBC Farm provides fresh, organic produce to a number of food outlets and the AMS Food Bank and Food Exchange work tirelessly to reduce food insecurity for students in need of support. 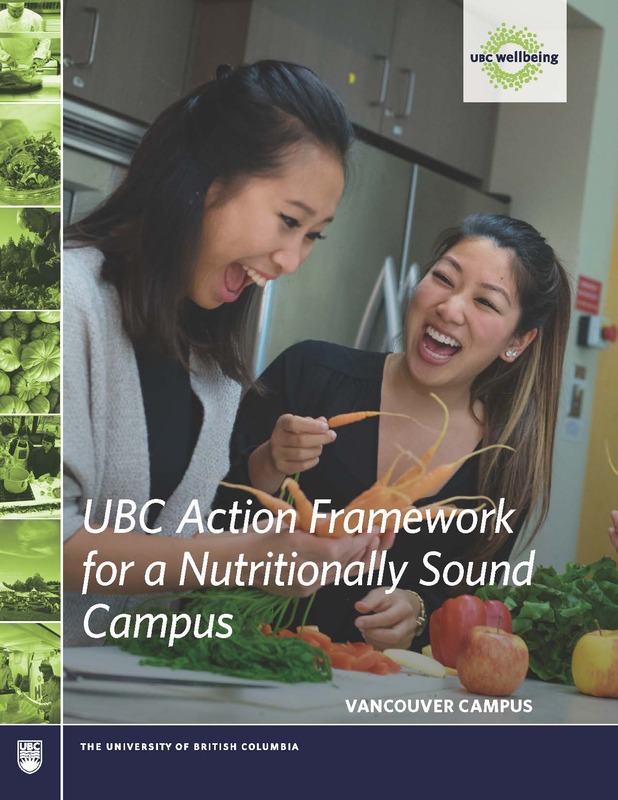 From Meatless Mondays in residences, to food recovery programs and weekly on-campus farm markets and more, UBC is exploring new ways to make nutritious food more accessible and available to our community and help achieve our vision for a nutritionally sound campus. A Food and Nutrition Working group was formed to collaboratively develop a framework to guide food and nutrition strategies and priorities across UBC's Vancouver campus. To learn more, download the Action Framework for a Nutritionally Sound Campus. UBC has a number of policies and practices in place to ensure that the food provided on our campuses supports the health and wellbeing of our community members. Across campus departments and units are working together to tackle concerns about food security and availability of healthy food options on campus. For more information on food and nutrition on our campuses, visit their websites.